A newly unredacted account suggests former Patriots tight end Aaron Hernandez was likely under the influence of a dangerous drug, K2, when he died by suicide. State investigators had more evidence than previously disclosed that former New England Patriot star Aaron Hernandez was using a dangerous drug in prison prior to his death — information that was concealed in public records and from his family and lawyers. This new disclosure is significant because it could shed more light on why the 27-year-old convicted murderer took his own life. It also raises questions about whether state officials sought to hide the extensive use of contraband drugs by inmates — including by one of their most well-known prisoners — and its potential influence on his death. “Any disturbing commentary about the state’s investigation was clearly hidden from the public, Aaron’s lawyers, and his family,’’ said George Leontire, a lawyer for Hernandez, as well as for his fiancee and young daughter. 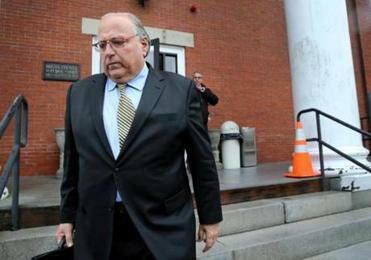 Lawyer George Leontire, who represents Hernandez’s fiancee and young daughter, has been pressing the Department of Correction to turn over complete records related to the suicide of Hernandez. Hernandez’s suicide took his family and lawyers by surprise. Only five days earlier, he had been acquitted of a 2012 double murder in Boston’s South End despite substantial evidence he was involved and at the scene. As a result, he had sounded optimistic about his chances of overturning his life sentence for the 2013 killing of Odin Lloyd. It turns out that same inmate, however, said more than that to prison investigators, according to the newly revealed interview. K2 is often called synthetic marijuana, but it’s far more toxic than pot. It comes as liquid or in the form of plant matter sprayed with an ever-changing array of chemicals that can cause hallucinations and other effects. It’s popular with prisoners because it’s difficult to detect in routine drug tests and has been easy to smuggle in. Dobson said Department of Correction officials “fully disclosed all information known” to the State Police Detective Unit investigating Hernandez’s death for the Worcester County district attorney’s office. But there still seemed to be a disconnect between what investigators knew and how they portrayed Hernandez’s death to the public. After Hernandez’s death, an autopsy was performed by the chief medical examiner. Toxicology tests were performed by an outside laboratory, NMS Labs of Willow Grove, Pa.
On May 4, 2017, two weeks after Hernandez’s death, the State Police issued a report stating that a “postmortem toxicology of Hernandez’s blood came back negative for all substances tested to include synthetic cannabinoids,’’ and asked for the case to be closed. Felix Browne, spokesman for the state’s Executive Office of Public Safety and Security, would not comment on how thorough the toxicology tests were, saying the medical examiner does not release case-specific details to the public. Past media reports, citing unnamed sources, have suggested Hernandez used drugs before his suicide. A Newsweek story, for example, said “traces of the drug” K2 were found after his death. But documents detailing his alleged K2 use have not been made public until now. Records recently reported on by the Globe Spotlight Team, coupled with the newly disclosed inmate interview, show that immediately after Hernandez’s death, officials had at least two tips that he had been using drugs. As reported in the Spotlight series, another inmate was able to sneak into Hernandez’s cell and allegedly smoked K2 with him two days before his death. In the wake of the Globe stories, and after more than a year of Hernandez’s lawyers pressing the Department of Correction for records, attorney Leontire was able to obtain an unredacted version of the page containing the paragraph about Hernandez’s alleged K2 use. Leontire has been pursuing records to learn whether the DOC was negligent in Hernandez’s death and potentially take legal action. Tim Connolly, a spokesman for the Worcester County district attorney, declined to comment on whether State Police detectives took into account allegations that Hernandez had used K2 before his death. Marilyn Huestis, a toxicologist who teaches at the Lambert Center for the Study of Medicinal Cannabis and Hemp at Thomas Jefferson University in Philadelphia, said it’s difficult for even top labs to test for, and keep up with changes in, these synthetic drug formulations. “These are so potent, the doses are so low, that when a person takes it you can only measure it in their blood for a short period of time,’’ Huestis said. “So labs will frequently miss it in the blood.” Urine tests are better, she said, but also require painstaking work. Prison advocates and inmates say the prevalence of K2, even at Souza-Baranowski, the maximum-security facility in Shirley, is widely known. The Spotlight Team earlier this month launched a six-part series and podcast that looked at the life and death of Hernandez. His case drew national attention as the only active NFL player to be accused of killing three people. The Globe report found that many people in his life, including coaches and an agent, seemed to look the other way as he was spinning out of control. He also was found to have the most advanced case of CTE — chronic traumatic encephalopathy — for someone of his age. The brain disease, linked to the combat of football, can lead to poor judgment and lack of impulse control, among other behaviors. The latest disclosure about Hernandez’s alleged K2 use could go to his state of mind on the night he died. The guard on duty the night Hernandez killed himself, Gerard Breau, was cited for misconduct, according to records previously reported on by the Globe. He skipped his 2 a.m. round, then found Hernandez hanging at 3:03 a.m. Breau has not responded to the Globe’s attempts to reach him. The Spotlight print series and podcast — Gladiator: Aaron Hernandez and Football Inc — can be found atbostonglobe.com/gladiator.